Sen. Rand Paul (R., Ky.) defended embattled aide Jack Hunter, whose past as a prominent pro-Confederate radio pundit was first reported by the Washington Free Beacon on Tuesday, even as the controversy threatened to unravel his recent outreach to the pro-Israel community. Paul held a conference call with Jewish leaders on Tuesday night to discuss his views on Israel and other foreign policy issues, reports the Daily Caller. The senator’s father, former Rep. Ron Paul (R., Texas), had a contentious relationship with the pro-Israel community, which the younger Paul has taken pains to avoid. Paul defended Hunter in an interview with the Huffington Post on Thursday, saying Hunter’s support for President Abraham Lincoln’s assassin John Wilkes Booth was "absolutely stupid" but downplaying it as a "a shock radio job." "Can a guy not have a youth and stuff?" Paul said. "People try to say I smoked pot one time, and I wasn't fit for office." Hunter’s comments, in particular his suggestion that Paul’s pro-Israel remarks have been "little rhetorical concession[s]" and part of "play[ing] the game," have reignited concerns that Paul’s occasional pro-Israel statements have not been genuine. "I think it’s important for Rand Paul to make it clear that when Hunter made those statements he doesn’t speak for Rand Paul, and everything he said about Israel he will adhere to," said Mort Klein, president of the Zionist Organization of America (ZOA). "I think he should publicly reject Hunter’s statements to those who might be displeased by his pro-Israel statements." A spokeswoman for Paul told the Free Beacon on Tuesday that Hunter does not speak for the senator. Paul has not specifically addressed whether Hunter’s comments on Israel reflect his views. Sen. Paul spoke in May at a ZOA-affiliated event, where he received a standing ovation. Hunter renounced most of his controversial positions in an interview with the Free Beacon on Monday, but declined to say directly that he no longer supports secession. Klein said he could not accept an apology from Hunter. "If someone has made numerous horrific statements, or ones that go way beyond the pale, applauding the assassination of Lincoln, one has to assume that’s who the person is and apologies made under political heat are not credible," Klein said. "I don’t accept Obama’s excuses for his friendships with haters, I don’t accept [Chuck] Hagel’s or [Samantha] Power’s apologies for their statements," Klein added. "So I personally could not accept [Jack] Hunter now apologizing and dismissing these statements. He’s made too many and he’s made too many that are beyond the pale." Other pro-Israel leaders have said the comments reflected what they already believed about Paul. "The Southern Avenger shouldn't worry, we didn't believe Sen. Paul either," said Noah Pollak, executive director of the Emergency Committee for Israel. "The way Hunter reportedly defended Senator Paul [on Israel] to his father's supporters is troubling," said one long-time official with a pro-Israel organization who asked to remain anonymous so he could speak freely. "It's not necessarily surprising." The National Jewish Democratic Council also blasted Paul in a statement to the Free Beacon and called on its counterpart, the Republican Jewish Coalition, to take a position. "For the last three days, Republicans have been following the story of Sen. Rand Paul’s controversial aide, and for the last three days I haven’t seen a single press release that calls out Sen. Paul from Republicans," said Aaron Keyak, interim director at the NJDC. 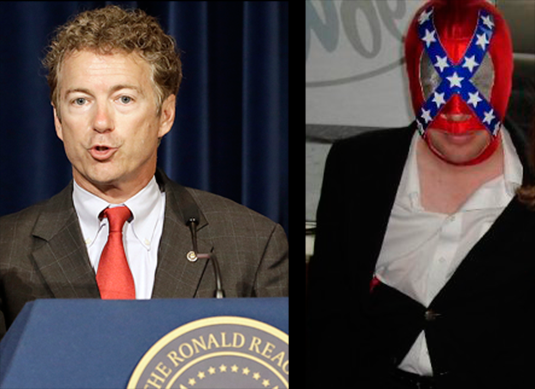 "We see that Sen. Paul is forcefully standing by his aide, despite everything that has come to light. Responsible Republicans including the Republican Jewish Coalition should be speaking out to make sure that the Republican Party understands that these types of views are unacceptable." The criticism has extended beyond the pro-Israel community. Kentucky Democrats have called on Sen. Mitch McConnell, Paul’s fellow Kentucky Republican senator, to condemn Hunter. McConnell is up for reelection and is facing Democrat Alison Lundergan Grimes. "Sen. McConnell likes Republicans to call him leader, and he has made himself heard on every issue he deems of consequence, real and imagined," Kentucky Democratic Chairman Dan Logsdon said. "I urge him to exercise some real leadership and condemn the inflammatory and hateful influences within his ranks and to take steps to rid his party of this extremist bigotry." The McConnell campaign responded by calling on Grimes to condemn offensive tweets by a liberal Super PAC that attacked McConnell’s wife. "If Dan Logsdon would look up from the disaster that is Alison Lundergan Grimes' campaign long enough to notice he would see that Rand Paul has done more to reach out to African American and Hispanic communities in the past six months than Logsdon has done his entire career," the McConnell campaign said in a statement "We would hope everyone agrees that racism has no place in politics, which is why it was particularly disappointing that Secretary Grimes failed to condemn a liberal Super PAC’s racist tweets targeting Senator McConnell’s wife." Paul has made it clear that he is standing by Hunter, who has served as his social media director since 2012 and co-wrote his 2011 book, The Tea Party Goes to Washington. "It's the same way any time you meet somebody who's got a large body of work," Paul told the Huffington Post on Thursday. "So if I hired you to work in my campaign, there would be some things I agreed with, and some things I disagreed with." "I think it's hard," Paul said. "The thing is, I grapple with this. What am I supposed to do? I'm going to have a lot of people working for me. They've all got writings and opinions." Slate blogger Dave Weigel wrote that Paul may have good reason to believe the Hunter flap will not be particularly damaging. "The lesson Paulworld took from the ‘associations’ scandals of 2008 and 2012 is that there's no real long-term damage from such scandals; Paul ended up winning all of Iowa's gettable delegates in the county caucuses, and his allies took over the state party," Weigel wrote. "And ‘politician claims he didn't write racist jokes that appeared under his name’ is a better story than ‘politician continues to employ guy that hates Lincoln.’"
However, some conservatives have balked at Paul’s defense of his close aide. "To start, this isn’t about one controversial comment, but a decade of extremism. Also, it can’t really be chalked up to his youth," wrote the Washington Examiner’s Philip Klein, noting that Hunter was 35-years-old when he was writing columns in support of secession. "Ever since his successful filibuster of President Obama’s drone program, Paul’s star has been on the rise, leading many pundits to take him seriously as a contender in 2016," Philip Klein said. "The Hunter controversy alone won’t kill his political ambitions, but his obtuse response demonstrates he still isn’t ready for prime time." Others questioned what Paul’s defense of Hunter says about him. "On Capitol Hill, staffers serve at the pleasure of their Member of Congress," said one long-time former Hill staffer who declined to be named. "It’s very telling that Sen. Rand Paul, despite the public revelations about Jack Hunter’s neo-Confederate views and inflammatory statements, nevertheless has chosen to keep Hunter on his personal staff," said one long-time former Hill staffer who declined to be named." This entry was posted in Politics and tagged Congress, Media, Rand Paul. Bookmark the permalink.